Both Brent Models B and C feature standard forward, neutral, and reversing options, controlled by a long-lasting toggle switch for easy adjustment while throwing. The modular-style foot pedal, motor, and control box make trouble-shooting and repair a breeze. These two-piece, unbreakable polyethylene plastic splash pans snap into place under the wheel head. 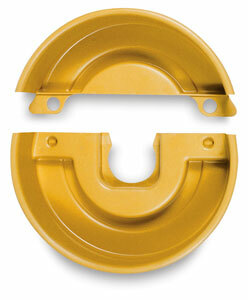 They are easy to remove and clean without removing bolts, screws, pins, or the wheel head. They measure 17-1/2" in diameter × 4-1/2" high (44 cm × 11 cm).